Scientists move us a little closer to the Matrix with electricity-generating cockroaches. Someone warn Keanu Reeves! 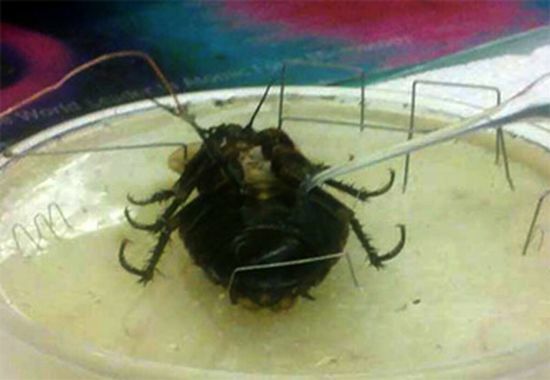 Scientists working at the Case Western Reserve University have managed to successfully generate electricity from chemicals found within a cockroach's stomach, using a hefty amount of science and a fancy biofuel implant straight out of Deus Ex. The whole process is a little tricky to follow, but essentially what researchers have done is placed a biofuel cell in the cockroach's abdomen, and then used an enzyme to break down the complex sugars residing in the its digestive tract. The simpler sugars, called monosaccharides, are oxidized by another enzyme, causing it to release electrons, which in turn create electricity. The total output of energy isn't very much, coming to a grand total of about 100 microwatts, meaning you'd need about 600,000 cockroach batteries to power up your average 60watt light bulb. The low-output hasn't stopped researchers from looking into shrinking the biofuel cell technology down so it can be fully implanted into an insect and coming with up with other kinds of implants like signal transmitters or measuring tools. For those concerned for the cockroach's health throughout poking and prodding, researchers found that their multi-legged test subject "suffered no long-term damage, which bodes well for long-term use" in the event they're able to refine the biofuel cell technology any further. "Insects have an open circulatory system so the blood is not under much pressure," explained Biology Professor Roy E. Ritzmann. "So, unlike say a vertebrate, where if you pushed a probe into a vein or worse an artery (which is very high pressure) blood does not come out at any pressure. So, basically, this is really pretty benign. In fact, it is not unusual for the insect to right itself and walk or run away afterward." The full report can be found here for those wanting the whole grisly but educational details. Me, I'll be loading up on bug spray for the coming cyber-insect war.